I'm so excited you are here today! I am part of a group of 6 talented ladies and organized this blog hop in honor of Mother's Day. We were all in a So Suzy Sessions class together. We are so excited to have the teacher herself, Suzanne Moore as part of this celebration. We are bringing you a collection of gorgeous Mother's Day Cards. To be entered into the drawing to WIN, you meet all the following criteria: - Visit every person's blog and leave a comment by 9 pm Central on 4/28/2017. Comments posted after 4/28/2017 at 9 pm Central will not be counted for the drawing. There will be one winner of the entire package drawn at random. Prize winner will be announced on 5/1/17 on my blog. Now on to the card I created for this hop!!!! This card was created using the following techniques. I will divide it up by each element in the card. Frame: cut frame from white cardstock to 4” x 3.5” and die cut a square from the center towards the top, leaving a ¾” border at the bottom. stamped 3 flowers from Winnie & Walter’s Addie’s Garden stamp set (Daffodil 1st, zinnia 2nd and Daisy 3rd). 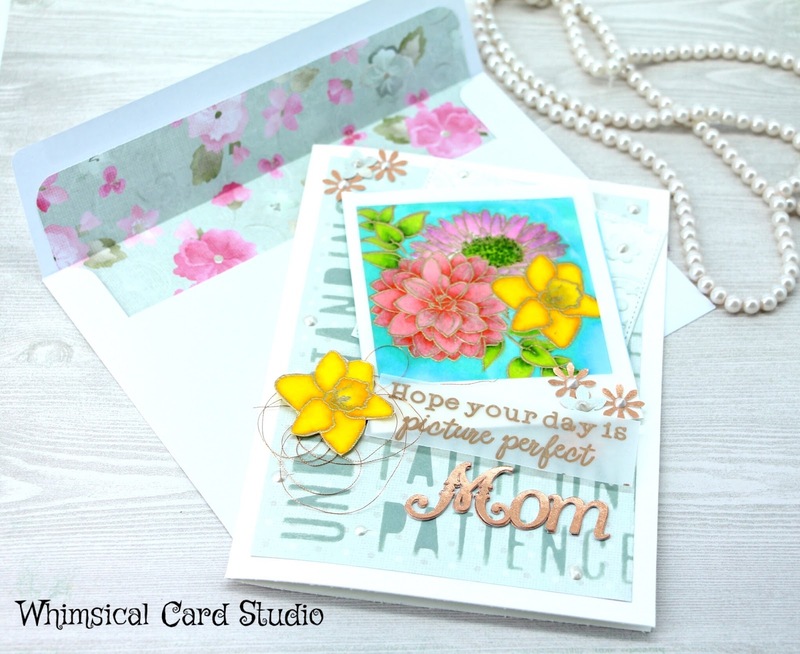 I stamped in 3 steps since I needed to mask the flowers as I stamped and then heat embossed. I created masks of each flower before starting this step using Inkadinkadoo masking paper. Next, I glued the frame on top of flower panel, then coated the entire piece with a product called Galaxy Glue to give the shiny finish you typically see on a polaroid picture. You could get a similar result from Mod Podge glossy finish or even glossy accents. I found that Glossy Accents tends to run off a surface like this easily unless applied very thinly. The Galaxy glue has a brush applicator, which made it the most convenient choice for me. I allowed this panel to dry overnight. In the meantime, I worked on the sentiment. I used Cricut Design Space to create the word “Mom” using the “Elegant Cakes” font. I used a shimmery copper cardstock and cut out the word 3 times, then glued them stacked on top of each other. I sized the word at about 2.5” wide. If you have a word die, that is an easier way to do something similar – I use my Cricut quite a bit for creating die cut words like this. The beauty of paper crafting is there are often several ways to accomplish the same look. To finish off the sentiment, I also used my Cricut’s writing feature to add the “hope your day is picture perfect” to fit in with the theme. I used a copper colored marker. After adhering the flower picture panel on top of the embossed square with Foam adhesive tape, I added Nuvo Ivory Seashell crystal drops in random spots around the frames. I used two Fiskars small flower punches to punch out tiny flowers in both the copper and the green & white patterned paper, then added Nuvo drop centers to add to the top left and bottom right corner of the picture frame. Before attaching the second Daffodil with foam adhesive tape, I coiled a small length of copper metallic thread and attached to the tape before pressing it down at the bottom left corner of the picture frame. The end result is a multi-layered card that I think would please many moms. After leaving your comment below to be part of our prize drawing, please visit the talented Mary Kay's blog to see the next fabulous card in the hop. You must comment on everyone’s blog to be considered for a random drawing for the prize package. Good luck!!! Such a beautiful card! with so many lovely elements - love it. Love the colored layers of this card! Fantastic! Thank you for stopping by and sharing your appreciation!! What a fun hop! Great card!!! Love it! Beautiful card. The Polaroid frame is great. What a gorgeous card. Love your awesome coloring and the gold accents. Great envelope, too. You make me smile! The funny thing was when I started I wasn't even planning to do that but it's one of those times when my brain worked in mysterious ways. Beautiful card! Lining the envelope completes it! Thank you Sharon - envelopes without liners just seem bare don't they? Thanks for dropping by! Just beautiful! I like using Spectrum Noir Markers. Thanks for sharing! Hello Ann - thanks for sharing your love of Spectrum Noir - they are pretty fab! I appreciate you visiting our hop!! Thanks so much! I am thrilled you played along with us. This year I am making mother's day card for some of the women at a Retirement home who children have past on. Love your card. What an awesome thing you are doing Shirley! I'm sure they will appreciate it greatly. Thanks for you comment. The use of colors and masking paper worked out perfectly for your card! How original! Love it. Wow thank you Jessica - I am so happy you shared your thoughts and played along today. Absolutely beautiful! I love the polaroid view of the flowers and you know I am smitten with that envelope!!! I am beyond honored to have you with us!!! This is such a fun card. Polaroid theme...brilliant! Love the bright colors and flowers are always a favorite. So creative!! You're so sweet! Thanks for joining us and sharing your thoughts. Beautiful card. Love all the colors. very pretty and I may just have to try out your embossing powder mixing idea for myself -I've been drawn to color up some rose gold embossed flowers lately too. Hi Kathy - so glad you liked the embossing powder tip. I will probably continue the experimenting to see what works the best. Thanks for commenting. Beautiful card! Love how you used a stencil to get just the right words in the background. Great try on getting rose gold embossing powder. I love your coloring ont he flowers. I thought it was watercolored until I read your description!! Thanks again for organizing this hop!! Thanks Marcia! I really hoped mixing would work. Maybe I needed a higher percentage of pink...or on the other hand I should just buy the rose gold powder from The Ton Stamps. Have a great weekend! Oops! Didn't put my name! No problem - Brenda - you will be in the drawing for sure. Thanks for stopping by! Beautiful card. Love the colors and dimensions. So pretty and perfect for Mother's Day! 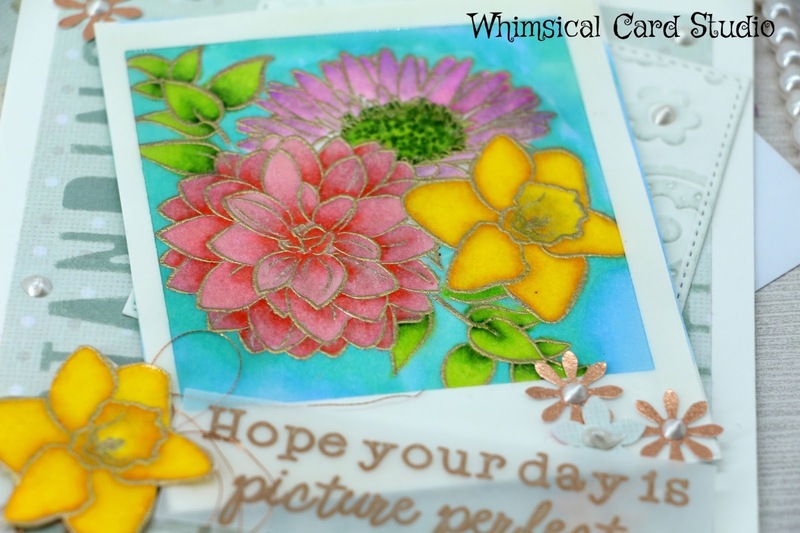 I love Winnie & Walter and I love spring and summer flowers so your card is just perfect in so many ways. I love all the layers and I see that you have lots of patience for creating a card with materials that have to dry and multiple steps in masking and embossing. Amazing card! I love the use of vellum on your card! It inspires me to go and try it on one of mine. Gorgeous card! I love to hear when something I did speaks to them. Thank you so much ! Hi Maria - I'm beyond thrilled you took time to stop by! I appreciate your support. Beautiful card!! Off to check out the others on the hop...have a great weekend!! Thanks Brenda - hope you have a great weekend yourself and enjoy the rest of the hop!! Autumn - I so appreciate your kind comments - it was a fun project! The embossing really adds to the loveliness of this card. A work of art. Beth - your words made me smile - so sweet and thank you for stopping by! Love the colors and the Polaroid frame is genius! Thanks Janis! so happy you liked the frame as much as I do. Beautiful card :) totally love the layers and attention to details. Thanks for sharing. Preeti - You are so welcome! Thank you for stopping by and leaving me a comment. Hi Jennifer - thank you!!! so glad you are enjoying the hop. I see from your blog that you are a W&W fan too! Have a great weekend!! Gorgeous! I love the use of the stencil to add the descriptive phrases for mom - such a neat way to personalize the card even more. The polaroid frame is lovely and so vibrant! Thank you for your detailed step by step breakdown of how you achieved this beauty! I'm a new follower of your blog as I love blogs that explain the creation process. Christy - you have truly made my day with your thoughts. I appreciate you letting me know that the details matter to you. I just followed your blog as well - looks like you do some beautiful work yourself!! Have a great weekend! Teresa very lovely card and I love your detail instructions. Thank you Lisa - I am so glad you stopped by and gave me feedback on the instructions. Enjoy the rest of the weekend and the hop! Happy Saturday Elise - so glad you dropped in and left a sweet comment! Great card! Love the colors and embossing. Thanks! Thanks a bunch Karen! So thrilled you visited today - hope you have a great weekend! Stefanie - here's hoping you find lots of inspiration - thank you so much for showing your appreciation - it means A LOT to me. Your Mother's Day card is so beautiful! I love the flowers you used. Thank you for sharing how you made your card. Have a wonderful Mother's Day. Sarah - thank you so much for stopping by and your sweet comment! I hope you have a lovely Mother's Day too. Love the florals and colors! Great inspiration for Mother's Day, too! Aagghh I gotta get crackin' on that! Thanks Jessica - I am so glad you stopped by! Oh wow the layout and colors of this card are wonderful! Thank you Lee - so glad you stopped by! 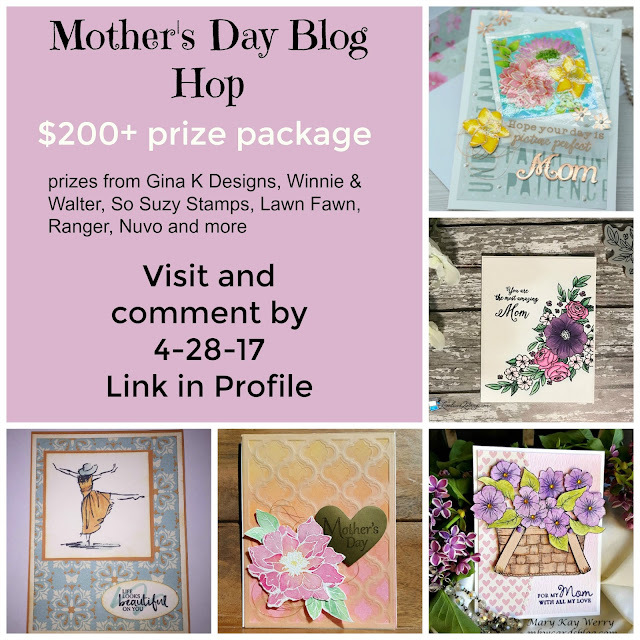 What a fun card and a fun blog hop!!!!!!! Thank you David - it has been a lot of fun for us too! WOW! Where to begin in praising your gorgeous card, as your pairing of all elements is absolutely amazing! The polaroid frame, the pretty flowers, the sentiments: so striking! And oh, how I adore the added touch of the background stenciling! Iced Spruce Distress Oxide...oh my! I think I've found a new favourite colour! Thank you for the how-to details and I agree 100%: this card and its beautiful accompanying envelope would bring mega-watt smiles to any mom receiving it! Carol - thank you so much for your very sweet comments! It brings me so much happiness to be on the receiving side for your praise. I wish you the best of luck in our drawing and so glad you stopped by!! Wow! Your Mom should be well pleased to receive this beautiful card. Thank you - I can hardly wait to give it to her! Such a beautiful card. I love the polaroid frame. The flowers are beautiful. Your coloring is lovely. so glad you stopped by - thanks for your sweet comments! This one is one of my favorite cards I have seen! Stunning to say the least!!! Wow - thank you so much Lizz - Your appreciation means a lot to me. Thanks for dropping by! A beautiful card. I like the way the envelope matches the card. Sandra - thank you for checking out the hop - matching envelopes just complete the card and there were quite a few comments about it. The metallic embossing powder is so eye-catching and a perfect complement to the beautiful colors you chose for your flowers. What a gorgeous Mother's day card! What can I say other than thanks a BUNCH for the wonderful compliment! Thanks for visiting the hop! Beautifully done! What a great idea, having this hop and spreading creative joy! Thank you Terri - I am so glad you stopped by. It has been a very fun journey for a first timer. Gorgeous coloring on this beautiful card! Love the spring flowers! Lots of pretty details on your card too! Hi Denise - thanks a bunch for stopping by and leaving me some comment love!! !